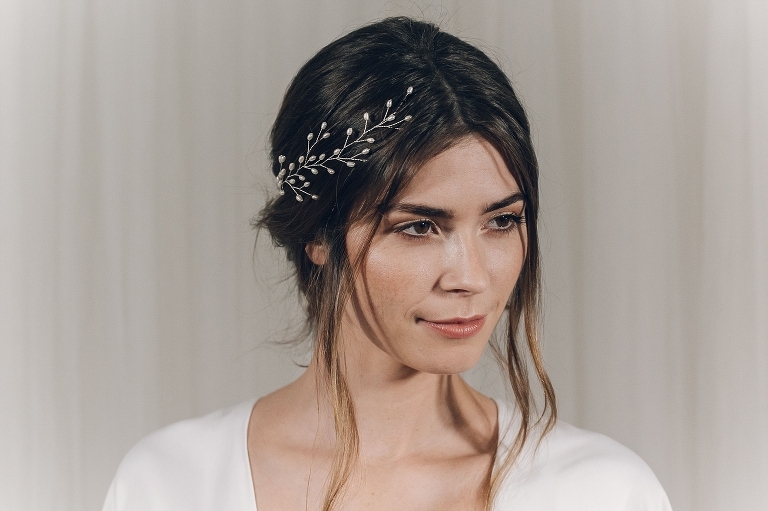 The right bridal headpiece for your wedding hairstyle | Jenn Edwards & Co. Selecting the right bridal headpiece for your wedding hairstyle is not always as straight forward as you’d think! With seven years of experience on this subject, I’m here to help! For the majority, brides (to be) have not experienced the sometimes daunting task of putting together a bridal ensemble, so I’d like to point out some key pointers for consideration. It’s always a good idea to have a hair trial in advance of your wedding day. Even if you’re set on a particular hairstyle, you may find it doesn’t work out as well with your hair type, or length. Your wedding hair stylist may even create an alternative look which you much prefer. You’ll want to be sure your bridal headpiece is the perfect shape and size to compliment your wedding hairstyle, and not the other way round. Most good hair stylists, nowadays, have a collection of headpieces and hair accessories for you to try at your trial. A hair vine is the most versatile option and probably my favourite to work with. As it’s name suggests, it’s a vine which can be moulded into any shape a bit like a pipe cleaner (excuse the ridiculous analogy). 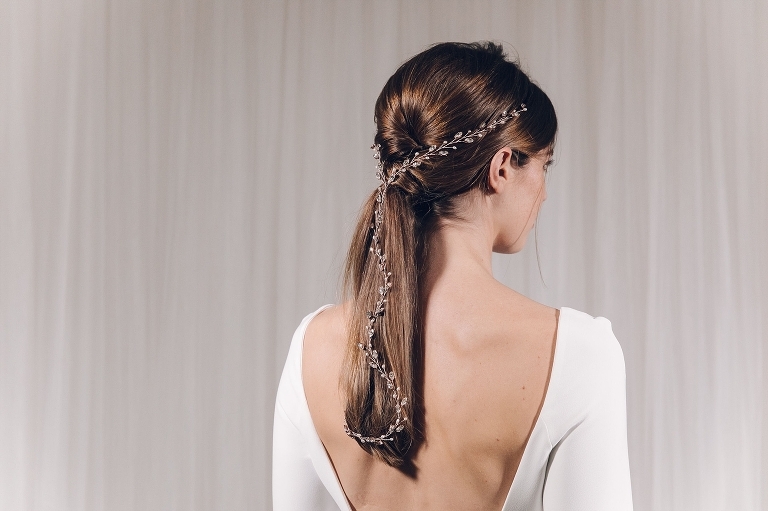 Available in various lengths, some are beautifully delicate such as Debbie Carlisle’s ‘Celine’ and ‘India’ – perfect to entwine into a braid or updo. Alternatively, you can opt for a statement piece like ‘Cresida’ which looks stunning with a very simple but elegant hairstyle. 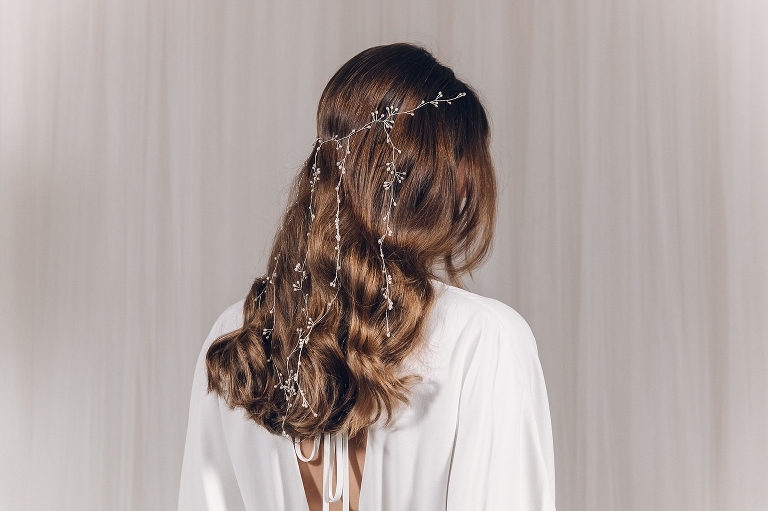 You can wear a hair vine as a head or brow band too so perfect if you want to switch things up in the evening and let your hair down. Hair combs are perfectly suited to most styles and usually are very sturdy and secure if placed properly. I always recommend a hair comb to our brides wanting to wear their hair down with one side pinned back. Always avoid plastic combs if you want to keep your hair stylist happy. Combs with plastic teeth offer zero flexibility making them impossible to work with. Debbie Carlisle’s Luna hair comb is a perfect example of a hair comb that ticks all the boxes for me, as a hairstylist. Most veils are attached with a comb so it’s almost impossible to position a second ‘hair comb’ in the same place. In a recent study by the National Institutes of Health more that 25% of the female population (myself included) suffer with hair loss or thinning. With this in mind I felt it necessary to cover this subject. A headpiece could offer a solution if you’ve exhausted other options. Fine or thinning hair is usually lacklustre and tired looking so a good helping of sparkle will help liven things up and draw the eyes attention to the headpiece rather than your hair. 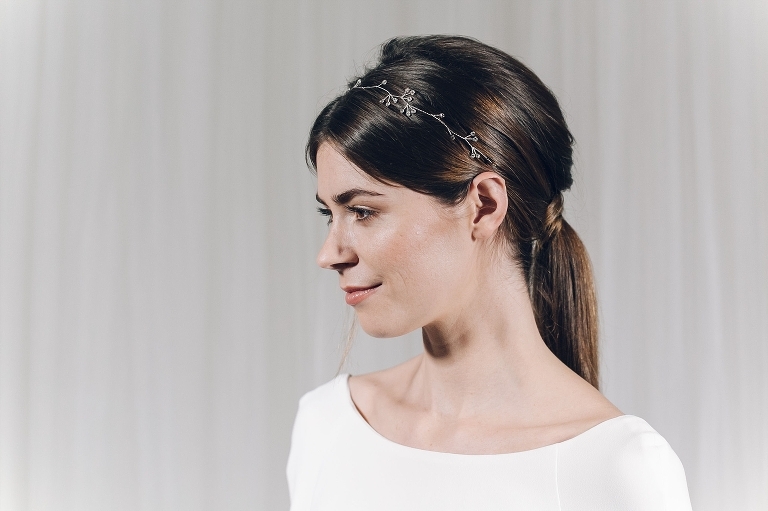 For a receding hair line you may want to consider wearing a wider bridal headpiece like ‘Hattie’ which partly covers your hairline. Always choose a headpiece on a band or a ribbon if you have very fine hair so’s not to weigh it down. Silver or gold, Crystals or Pearls? This is something you may want to consider if you have an embellished gown or other jewellery items. In my opinion, accessories shouldn’t complete with a wedding dress. Too many items of jewellery can overcook your entire look. Often, a beautiful headpiece is all that’s needed to complete your look. 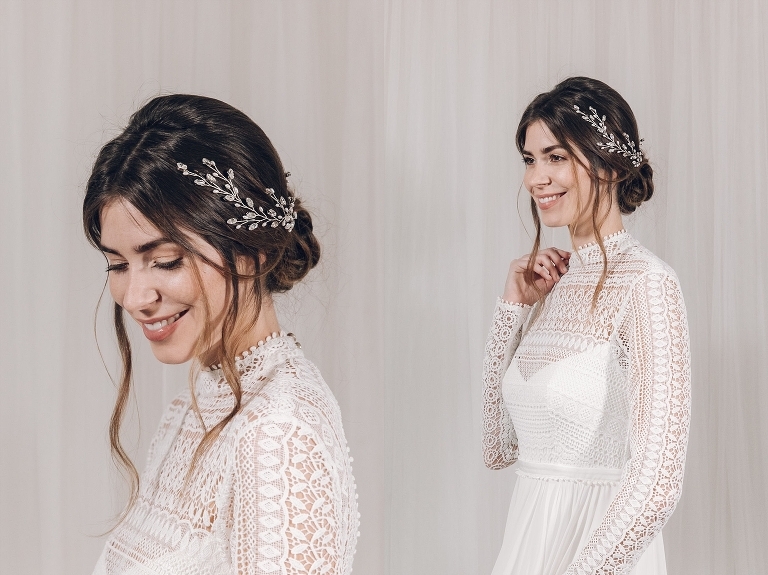 Top bridal trends for 2019 include simple, fitted, long line wedding gowns and sleek ponytails. A statement headpiece looks amazing with this look. The less expensive bridal accessories available in two very well known high street retail stores are mass produced. They’re made from inferior materials with the use of glue to fix imitation crystals and pearls in place. And that is all I should need to say on this subject! In some cases it is wise to try a headpiece before you commit to buying it. Some headbands may pinch behind the ears! A tiara can look more like a crown when placed with certain wedding hairstyles. Sometimes pieces are just too heavy for certain hairstyles altogether. Most bridal headpiece designers will have multiple stockists with pieces available to try on. Definitely take advantage of this, if you can! Debbie Carlisle has multiple stockists all over the UK. Our brides take full advantage of my own personal collection of beautiful Debbie Carlisle pieces at my Sheffield hair and makeup studio. I’m not affiliated to Debbie, nor do I gain financially from recommending her headpieces. I do simply because I love them so much! I hope you love the following looks we created using Debbie Carlisle headpieces from her newest collection – The Stardust Collection. Dresses: Kate Beaumont, plus Rembo Styling, Jesus Piero and Charlie Brear gowns via Cicily Bridal.